the fig-leaf oan the lion is a clue! Attached to the website is a messageboard which has a worldwide membership. 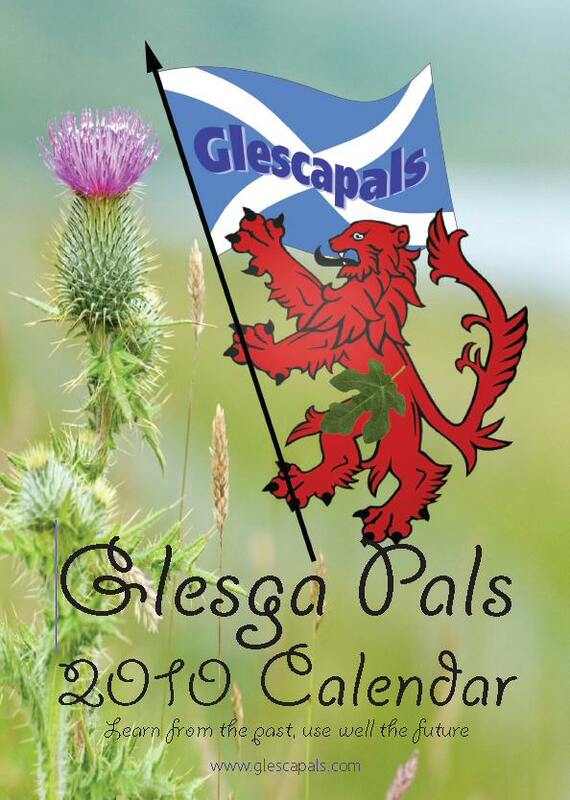 GlescaPal Nell, now living in London, is Admin on the messageboard and it was her idea to compile this GlescaPals ‘glam’ calendar much to the amusement of the ‘Pals. The comments came fast and furious! Nell appealed tae the GlescaPals tae email her their ‘photos’ tae be published oan a GlescaPals calendar. 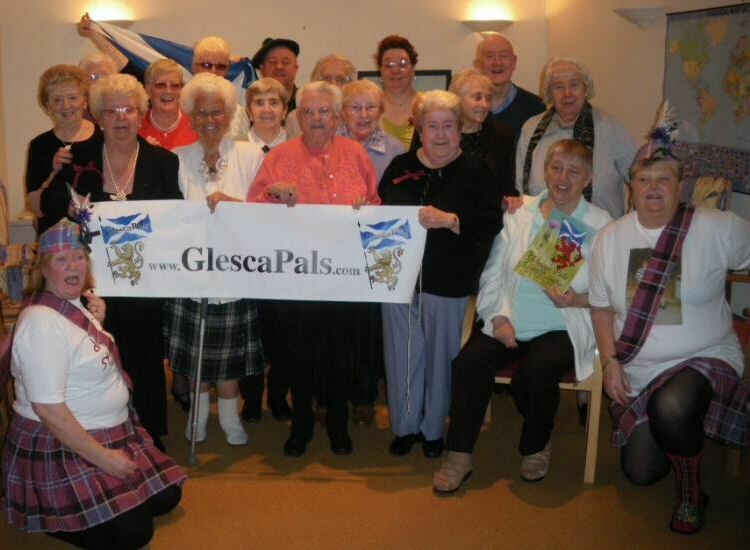 The patter was flowing and many members were being ‘coaxed’ into providing a photo. “C'moan Beth, it'a a laugh, ye cin dae a nice pose, hide the bits that matter and leave the rest tae the imagination” “By the way Scotty should you no chinge your wee saying tae ‘Lord of the G Strings’"
Nell started a petition tae get me tae take mah kegs off and pose furr a photie! Surprise surprise the names came fast and furious “ we canny hiv a calendar without a photo o’ the Webmaister wis the cry? ?” Aye right, thought I and suitably replied. “Many thanks furr yer petition.. whit the hell hiv ah let mah self in furr! I was at Jeromes photo studio this morning at Brigton Cross tae get a professional 'shoot'. It shut years ago apparently. So ah went wi the wee bluebell doon tae the green tae get an ootdoor shot o' me in the buffty. Tae show aff mah green credentials, so tae speak. Ah gote arrested furr indecency. See ahve gote a polis record noo because of this GlescaPals glam calendar. TT Wance the calendar hits the market, Mammies willnae hiv tae frighten their weans witless wi stories o bogeymen an Flannelfeet - the full horrors o the Glesgapals Glam Calendar will be enough tae send them tae bed screamin fur mercy. As Webmaister of this wonderful website I’d like tae thank my admin gal Nell and her son in law Doug for putting this 2010 GlescaPals calendar together, it was all a bit a fun and the patter from October tae December 09 has been brilliant. 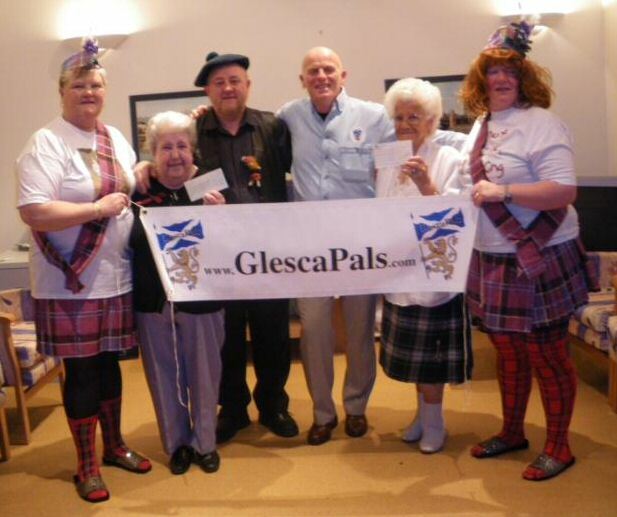 A wee Glesca pensioners club will benefit from your donations. So all that is left for me, is to sincerely wish you, a Happy, healthy and Prosperous New Year, God Bless you all.